Images © Nicola Tree. All rights reserved, please do not reproduce without permission, thank you. http://www.nicolatree.com. Auntie Maureen and I were introduced last year on Facebook through a mutual friend (thanks, Kimberly). While visiting London in the fall, I took the Tube to Walthamstow and met the charming Auntie M in person at her shop (Brown Paper Bag) within a shop (Penny Fielding Gallery & Interiors). Auntie M hails from all over having been born in The Netherlands, lived in the UK and also in Austin, Texas as a teenager. She studied art history at University of Utrecht in The Netherlands and Communications and Audio-Visual Production Studies. At the Royal College of Music in London her studies included Music and Musicianship and Creative Leadership. 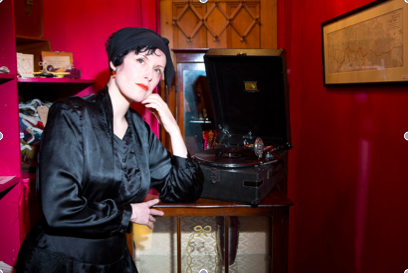 Currently Auntie M splits her time as DJ and running her own business selling vintage men’s clothing. Sporting vintage full-time, she always looks splendid. Auntie M and Over Dressed for Life recently had an e-mail chat about vintage clothing. How long have you been wearing vintage? I have been wearing vintage since my sisters and I discovered a trunk full of 30s, 40s and 50s clothes plus uniforms our mum had saved up as a dressing-up box. Why do you choose to dress vintage full-time? There is something magical about having the power to transform your daily experience of life, of people, of events. By shifting perspective to times gone by, an otherwise humdrum day-to-day can be transformed into something not quite here, not quite of this world, of this time. By believing in the clothing and the style of, say, 1937, the character that emerges from this vintage transformation is no less who I am, I have merely chosen to piece my identity together from memories and sentiments from the past. In the Western world we all have the privilege of designing our person as life does not merely happen to us, we can stage it as befits. And that is why I opt out of what is fashionable or on trend now and instead create my own historical bubble and experience. Do you stick with one era or switch around? Do you mix eras? My style sits around the start of the 1930’s to early 1940’s. While that is to me the most exciting decade for women’s fashion design both in make-up, hair as well as clothing, other decades and styles are equally impressive. Just not for me. What inspires you about vintage style? Wearing a genuine vintage piece of clothing is as if I put on a cloak of memories and emotions. The charge of the garment’s history excites me. No one else owns this garment anymore, it is unique and highly personal. And that in addition to the craftsmanship, the tailoring, the quality use of materials, the drape of cloth, the architecture of wearable designs topped with stoles, bags, hats, gloves, heeled shoes is all about the feminine form. It inspires me every day. Mixing modern with vintage – yes or no and why? If you mean modern reproduction vintage clothing I would personally recommend as vintage pieces do disintegrate, rip, fade over time and become unwearable. If dancing is your cup of tea, a nice repro dress will save a genuine collectible frock from suffering the sweat and strain. I am also in favour of mixing and matching vintage with new fashion. It is all about finding a style you can afford, suits your body shape, your colouring as well as your lifestyle and makes you feel like a million dollars! What are you favorite spots for vintage shopping? Charity shops can sometimes throw up a gem or two. For unusual, weird and wonderful pieces I enjoy the Thursday Antique Market in Spitalfields. And for instant vintage frock power I prefer The Vintage Emporium as well as Hunky Dory around Brick Lane in East London. What do you enjoy about selling men’s clothing? My customers are young on-trend hipsters who enjoy mixing up styles. But also chaps who take their vintage styles very serious, and musicians, actors, even a magician. Plus classic gents who favour the heritage of garments over cheaply made fashion rags. And often enough women who want to make a statement with a men’s suit, a boyfriend blazer or big belted shirt. Any vintage style tips you’d like to share? Agree on that, Auntie M. Hats are really a must for any and all outfits. Thanks for chatting with Over Dressed for Life. Daniel Day Lewis and Rebecca Miller looking quite smart at the 2013 Academy Awards. Check out Over Dressed for Life’s favorite Oscar night fashions on Facebook. While you’re there, Like our page … please. Jacqueline Durran costume for Anna Karenina. If you want to play into people’s idea of luxury, referencing the 1950s is useful. It was a good match, because the cinched waist, fitted bodices and big skirts were similar to the shapes of the 1870s. – British Costume Designer Jacqueline Durran. In an interview with The Telegraph, Ms. Durran explains why the 1950s influenced her costumes for the period film, Anna Karenina. Last night Ms. Durran won Best Costume Design Oscar for Anna Karenina. Film costume followers will recall Ms. Durran’s 1930s emerald-green dress in Atonement, for which she was also nominated. Anna Karenina is her third nomination but first win. Claire E. (second from the right) and her models. Congratulations to Collector’s Choice Antiques in Lafayette on another fabulous fashion show. Styled by Claire E. and Eileen Tong, the show celebrated the Lunar New Year (year of the snake) and featured Chinese style dresses, suits, jackets as well as some beautiful antique Chinese robes. 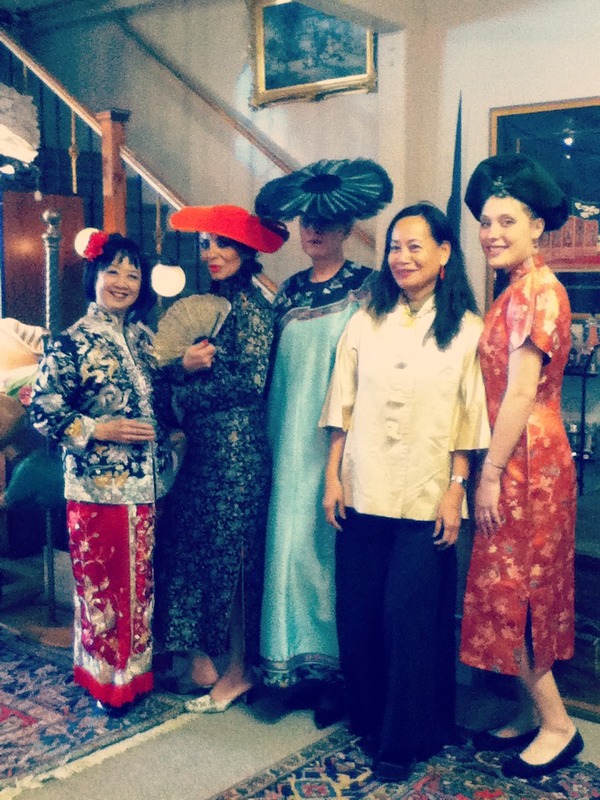 I tip my hat to Claire on her stylish eye for pairing traditional Asian silhouettes with vintage hats. This combination is a real winner in shifting specific looks to more universal outfits suitable for any dressy occasion. Eileen stayed simple styling her robes with long beads in jade or carved ivory and heels or black satin slippers. What struck me is how outstanding these ensembles would be at the opening night of the San Francisco opera or symphony. 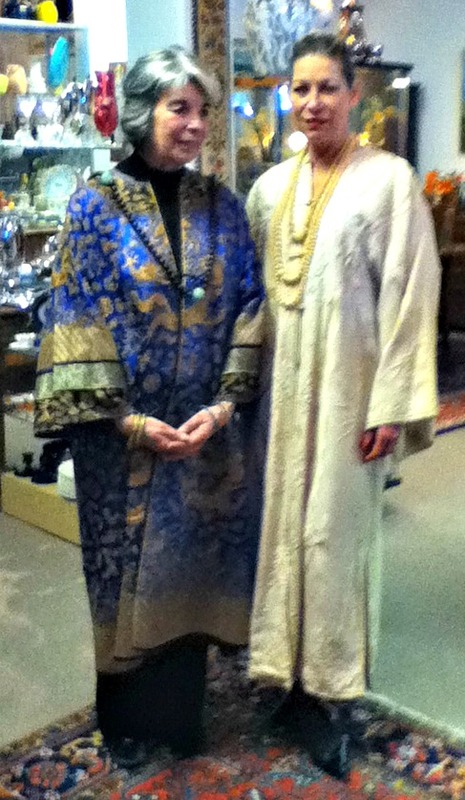 I say there’s no need for designer duds when one could sport a one-of-a-kind antique Chinese robe. Collector’s Choice Antiques puts on the most charming fashion shows and lucky for us there’s another in the works scheduled for Sunday, April 14, 2013. The fun starts at 1pm. Collector’s Choice Antiques is located at 3574 Mt. Diablo Blvd., Lafayette. Questions? Give them a call – 925-299-9400. Dries Van Noten design for spring/summer 2013. I think now you can be dressed in so many different designs and so different many styles and still look very fashionable. And I think that’s the fun thing of fashion for the moment. – Dries Van Noten, fashion designer. Step into Mom’s Closet for Valentine’s Day. Next Wednesday, February 20th grab your favorite Valentine and head on over to the Rex Hotel in downtown San Francisco for another fabulous Art Deco Society of California lecture. This time it’s all about vintage fashions for the gentlemen. 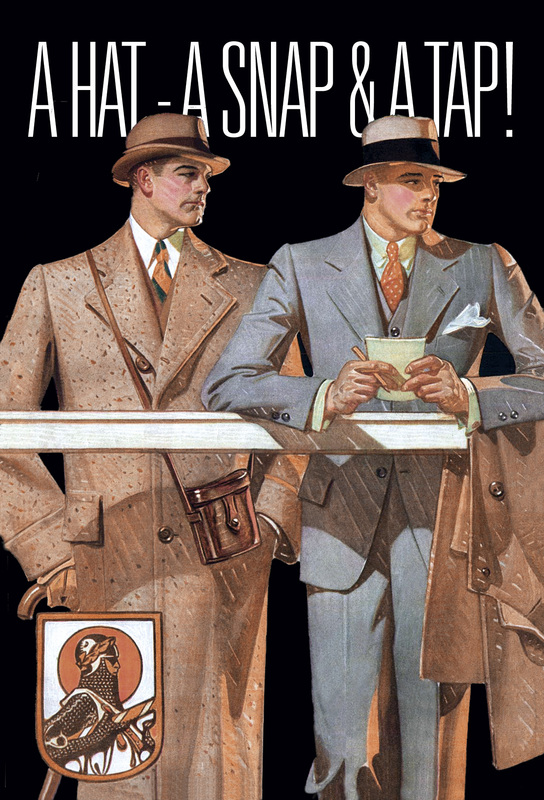 ADSC President Joseph DiPietro and vintage clothing dealer Roberto Isola will talk details of why and how men wore what they did in the stylish days of the Art Deco period. Plus special guests from San Francisco’s own Cable Car Clothiers will be adding their two cents. Ladies have something to learn as well. Not only can we get an idea of how to help our guys look their best in vintage, but we can perhaps get inspired to add a touch of menswear into our own ensembles. I will be there sporting my latest outfit created by Theresa LaQuey Couture. I’m calling it The Londoner – 1930s style trousers and a vintage style blouse made from Liberty London fabric. A Hat, A Snap, & A Tap – ADSC Lecture is on Wednesday, February 20, 2013 at the Rex Hotel, 562 Sutter St., SF. No host cocktails at 6:30pm, lecture begins at 7:30pm. $10 for ADSC members, $15 for non-members. Vintage attire is always welcome but not required.